The famous playwright Tom Stoppard and Marc Norman wrote the screenplay for this film. In my opinion, it is nothing short of brilliant. They deservedly won the Oscar for their writing, as did the movie for Best Picture. The story addresses many themes, including the difficulties in presenting a play, the author’s sources of inspiration, and the role of women in society. The film takes place in London in 1593, and we immediately discover that, just as now, the elevated goal of presenting great art must take into account its cost. So, there is competition for the audience’s patronage. We have two theaters vying for the population’s attendance – The Curtain, where England’s most famous actor, Richard Burbage (Martin Clunes) resides, and The Rose, built by Philip Henslowe (Geoffrey Rush), who, has “a cash flow problem.” The person he owes money to is Hugh Fennyman (Tom Wilkinson), who literally lights a fire under him until Henslowe promises the lender proceeds from William Shakespeare’s new comedy. According to the business reality of the time, Henslowe wants to give the masses the simple escapism that they (and many still do) desire, which is “comedy, love, and a bit with a dog.” At the time, despite the poetry delivered by Christopher Marlowe and Shakespeare, the theater was considered a place of low morals. As one protester says, “Licentiousness is made a show! Vanity and Pride are likewise made a show! This is the very business of show!” the last words, of course, are a play on “show business,” and the implication is not a complimentary one. 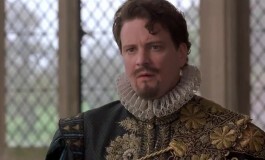 For example, Henslowe gives a part to his stuttering tailor just because he owes the man money. The artist, without whom there would be nothing to “show,” is dismissed as unimportant in the world of financial reality. When Fennyman asks who is Shakespeare, Henslowe replies, “Nobody, the author.” In the beginning, Fennyman wants his money up front. When Henslowe mentions that he must pay the actors and the author, Fennyman says they will get a share of the profits after his expenses are met. Henslowe says there are never any profits, and he realizes that the money man has “hit upon something,” that is, business comes first, art, second. Henslowe does offer enigmatic hope about the theater experience working out, despite being an endeavor “of insurmountable obstacles on the road to imminent disaster.” He says, “Strangely enough, it all turns out well.” When asked how, he says, “I don’t know. It’s a mystery.” As we see, magically, he is right. 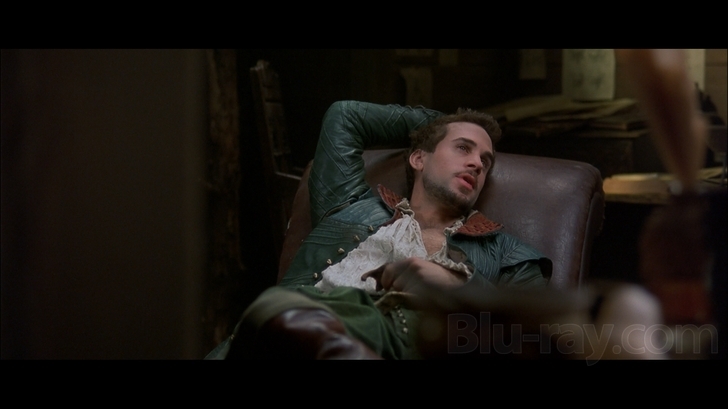 He starts off his talk with Moth by saying “Words, words, words,” the line eventually finding its way into Hamlet. There are many instances where the movie suggests the great writer came upon his words and stories from circumstances or from others. The protester, who condemns the world of the theater, refers to The Rose being closed due to the plague by hoping for the same fate to fall on The Curtain, thus causing “a plague on both your houses.” This line Mercutio utters concerning the Capulets and the Montagues in Romeo and Juliet after Tybalt mortally wounds him with a sword. 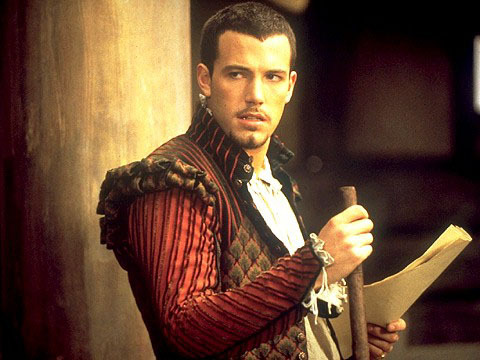 And, it is Marlowe (Rupert Everett) who suggests the basic plot of the play and provides the name of Mercutio. The actor, Ned Alleyn (Ben Affleck), says there must be a scene “between marriage and death,” which Shakespeare turns into the one depicting the marriage night. The film throughout deals with how life may inspire art, and then how art, though a fiction, provides insight into life. 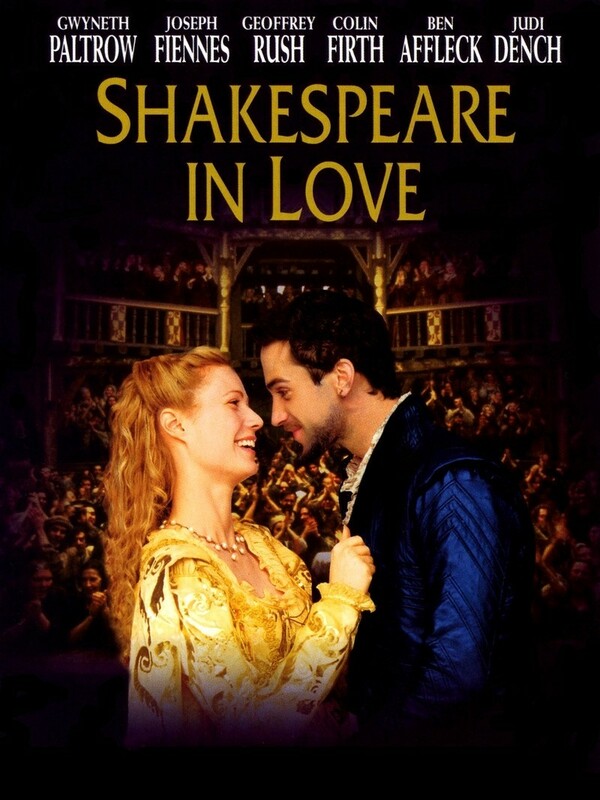 Shakespeare thinks his muse is a woman named Rosaline, but it turns out that she is an object of lust, not only for the playwright, but also for Burbage and Tilney (Simon Callow), the Master of Revels, a sort of morals policeman for the stage, who in his own life has no problem with fornication. 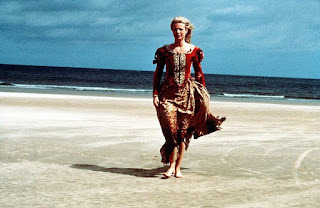 In the eventual play, the unseen Rosaline plays a similar role for Romeo. In the film, Shakespeare meets the woman with whom he will share true love, and be his genuine muse, at a family party at the home of the woman’s parents, just as Romeo meets Juliet. He pursues her while under her balcony, which of course, finds its way into the play. 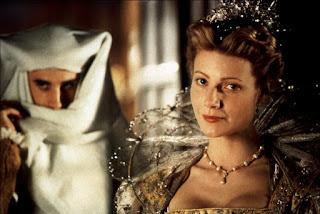 His lady has a nurse, who facilitates the carnal machinations of the lovers, as does the Nurse in Romeo and Juliet. And, when the lovers cannot be permanently joined, because Shakespeare, although estranged from his wife, is still married, and has no title or wealth to offer to Viola’s privileged family, and she is betrothed through an arranged marriage to another, he exclaims “I am fortune’s fool!” as will Romeo, bemoaning the circumstances beyond their control. The lady Shakespeare loves is Viola (Gwyneth Paltrow, winner of the Best Actress Oscar for this role). We see her love of poetry and plays when she attends one, and recites the dialogue word-for-word. She tells her nurse (Imelda Staunton) that “I will have poetry in my life. And adventure. And love. Love above all.” She doesn’t want what has passed for love in plays before, “not the artful posture of love.” She wants “love that overthrows life. Undbiddable, ungovernable, like a riot in the heart.” She feels that a play about love cannot be true if a young boy and not a girl plays the female role. Her desire is for a life of love that breaks all bounds and rules. 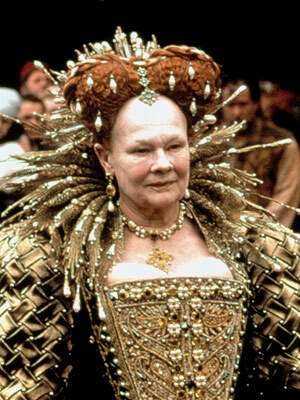 She publicly disagrees with Queen Elizabeth (Judi Dench, Oscar winner for Best Supporting Actress), who believes that plays just show love as pretty, comical or lustful, but can’t make it true. Viola says there is one who can show the true nature of love (although she does not name Shakespeare). It is funny that when they meet, he is so overwhelmed by his love at first sight, that he when she says she heard he was a poet, he can only nod, causing her to say, “But, a poet of no words?” In the play, Shakespeare has his characters have no such problem, as his art soars above reality, as the two lovers improvise a sonnet together. When told that she needs to get some sleep, Viola says, “I would stay asleep my whole life, if I could dream myself into a company of players.” But, in 16th Century England, she almost might as well have to escape the real world to make her dreams a reality. Women associated with the theater were considered those of ill repute. Young boys whose high voices had not been metamorphized into deeper tones by puberty played young girls. Shakespeare’s works have a great deal of fun with this practice, with male youths playing females in roles where the women characters pretend to be men. This film alters the charade by having a woman pretending to be a man who eventually pretends to be a woman. Viola wears a wig and binds her breasts because she can’t audition for a part as a woman, and pretends to be a male, Thomas Kent. She is so good at it, that Shakespeare wants her to play Romeo. As Kent, Viola pretends to be visiting Viola’s house as the nephew of one of the servants. The writer gives a letter to Kent professing his love for Viola, which he reads to him, who is really her. In a line that rivals the great playwright’s own talent, Shakespeare describes his love “Like a sickness and its cure together,” revealing the true nature of love, which the writer of Romeo and Juliet and the playwrights of this film can both boast to understand. She is his true inspiration (the word meaning “to blow life into,”) and he now not only can write his play, but also maybe his most famous sonnet, the one that begins with “Shall I compare thee to a summer’s day.” After Kent/Viola kisses him, he learns the truth of her identity from the boatman. It is a witty and ironic exchange the two have when she says, “I have never undressed a man before,” and he comments, “It is strange for me, too,” as he takes off her manly disguise. As they undress, he unwinds the cloth that that has bound her breasts, freeing her of society’s restraints, and allowing her to be herself in true love. 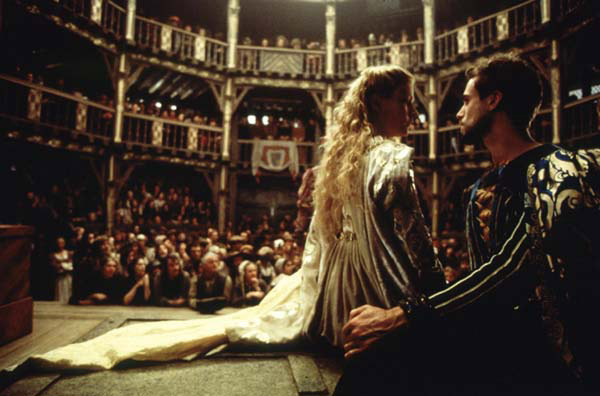 Before the wedding takes place, as they prepare for the opening of the play, we see Viola pretending to be Romeo on the stage, and then reading Juliet’s part (for Shakespeare has changed the character’s name) in her bedroom with the writer, where she can more truly enact a person in love drawing on her feminine self. Their desire for the night to continue and their denial of the breaking day finds its way into the play. 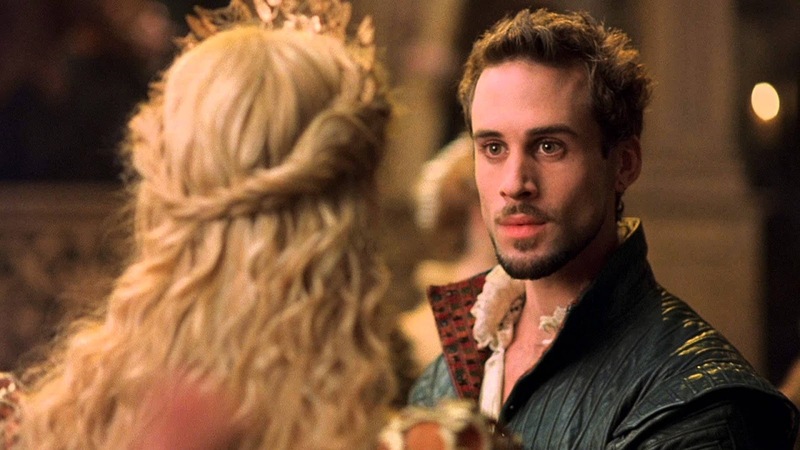 Although Shakespeare declares that “Love knows nothing of rank or river bank,” they realize that they only have this short time together, what Viola calls “a stolen season,” while her parents are away and before the nuptials. 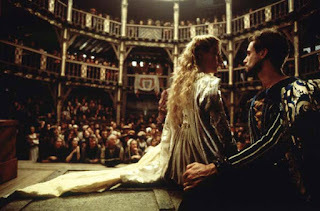 Shakespeare says that “family, duty, and fate” will divide the lovers, and that is what happens to Romeo and Juliet, too. He announces to the acting troupe that he is no longer writing a comedy. She says to him, “As Thomas Kent, my heart belongs to you. 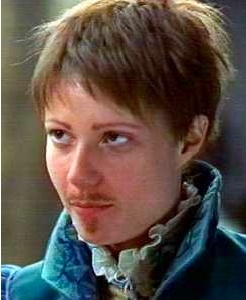 But, as Viola, I must marry Wessex.” It is ironic that she can love him only while disguised as a man in a make-believe fantasy, but in the real world their love is prohibited. 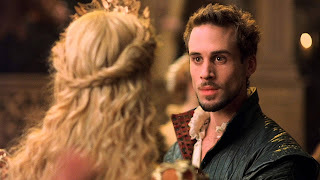 Even Shakespeare must switch gender roles to hide their relationship when Wessex makes a surprise visit to Viola’s house, and the writer pretends to be a female visitor acting as Viola’s chaperone. The next film is American History X.